The costs of the beautiful fabrics that cover your furniture can’t just be measured in terms of money. There is also an environmental cost—what creating that fabric does to the earth. For example, what is the fabric made from? How are the fibers that create the fabric grown? How is the fabric finished? How far does it have to travel to get to your living room? What happens to it when its life is done? First, the bad news. The textile industry is one of the most polluting industries on earth. Large-scale farming uses huge amounts of water and typically involves fertilizers and pesticides that make their way into our water and air. Then, during the dyeing process, leftover dye washes out into the water supply, polluting it. Heavy metals are used as dye fixatives, adding to water and air pollution, and the bleach used to whiten fabric also can have a significant negative impact. On the bright side, natural fabrics like cotton, wool and linen are renewable and will decay at the end of their life, so they won’t be in the landfill forever. So should you just go with cotton, since it’s a natural fabric? You’d think so, but even that can come with environmental impacts since non-organic cotton is the most pesticide-intensive crop in the world. And that natural indigo dye used to make denim blue? That’s actually more toxic than most synthetic dyes. 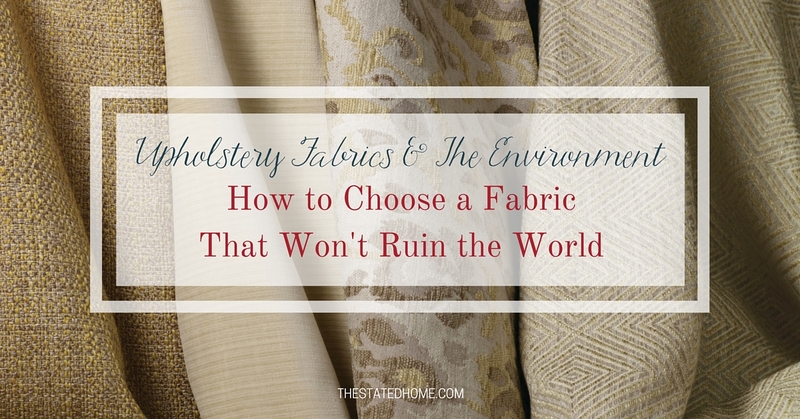 Although no fabric is 100 percent good for the environment, it is possible to make an educated choice when selecting your upholstery covering. To help you do that, we took a look at some common upholstery textiles and where they fall on the environmental impact spectrum. As manufacturers’ techniques vary, it is difficult to say that one is definitely better than another, but hopefully this helps. As we mentioned above, traditional cotton plantations around the world use a lot of pesticides and chemicals. Organic cotton, which is grown using natural fertilizers and without chemical pesticides, is definitely a move in the right direction. That said, organic cotton can still cause environmental damage due to chemicals used during the bleaching or dyeing process. Even going with a natural or vegetable-based dye is no guarantee that the environment will not be harmed. This article from Popular Science sheds light on that. Choosing an organic cotton in its natural color (like cream, tan, or light green) is often a safer bet. Clearly one of the most renewable fibers (thanks, sheep! ), wool has many excellent properties—it’s even naturally resistant to fire. However, traditional sheep farming involves applying chemicals to protect the animals from insects and disease. Plus, sheared wool is often treated with chemicals to keep it from getting moldy while being transported to the mill. And let’s not forget that one sheep can release 20 to 30 liters of methane (more commonly known as gas) per day. Multiply that times thousands of sheep and you’ve got a lot of methane! There’s not much you can about that last factor, but go for organic wool, which is produced using sustainable farming techniques and without the use of toxic sheep dips. Silk is another highly renewable resource, as a single moth can lay hundreds of silk-producing eggs. And the silk worm larvae eat the leaves of mulberry trees, which doesn’t require pesticides or fertilizers. But it takes a lot of mulberry leaves to create silk – an acre of trees can produce only 35 pounds of the smooth fabric. Then there’s the animal sacrifice that occurs: The larvae are killed in order to obtain the silk thread from their cocoons. Even though the thread itself is produced in a way that may have a relatively low environmental impact, it’s also important to consider the chemicals used during the dyeing process and the energy required to transport it from where the silk worms are raised (sadly, not the US). Still, silk can be one of the more environmentally friendly textiles. Linen is made from flax, a plant that is naturally immune to insects and disease. As a result, little is required in the way of chemical treatments when growing the plants (to put it in perspective, cotton uses seven times as much). Another bonus: During processing, linen uses one-fourth of the water that cotton does and produces little waste as every byproduct is put to use. Linen does not take dye well, so leaving linen in its natural color is better for the environment than putting it through a dyeing process. Rayon, also known as viscose, is neither wholly natural nor wholly synthetic. Cellulose (which comes from wood pulp) is processed so that it breaks down enough to be spun into fiber. Rayon’s impact on the environment depends on the source of the wood and the nature of the processing. The wood pulp usually comes from a renewable plant such as bamboo, or beech or pine trees. And rayon breaks down quickly once it hits a landfill. That said, old growth forests may be cleared to make room to grow those renewable plants. The rayon might also come from eucalyptus, which uses a great deal of water. Plus, processing can use strong chemicals that may pollute the water and air. Made from petroleum, polyester clearly does not fall into the category of natural textiles. The manufacturing process uses a great deal of water for cooling and creates potent greenhouse gases. Unlike natural fabrics, polyester is not biodegradable, so it remains in landfills. But it does recycle beautifully and can even be made out of recycled materials like plastic bottles. Acrylic is a synthetic (aka man-made) fiber made from a chemical substance that is also used to produce plastics. Color is added during the manufacturing process, so you won’t see the same environmental impact that happens when fabric gets dyed. There is some disagreement as to how quickly acrylic breaks down once it makes its way to the landfill, but those who believe that it breaks down easily classify it as eco-friendly even though it is manufactured using chemicals. Polypropylene is created from chemicals, but it’s generally considered to be better for the environment than lots of other textiles. Its manufacture creates very little waste and it is relatively easy to recycle when compared to most other fabrics. Like acrylic, polypropylene is usually solution-dyed, so the fabric does not need to be dyed after production, eliminating the dye run-off and chemical fixative problems associated with many other fabrics. Being eco-friendly can come without sacrifice. The Stated Home’s upholstered furniture is made by Lee Industries, a company that focuses on the environmental impacts of their products. For example, Lee asks its vendors to provide upholstery fabrics that have a lower environmental impact, such as organic cotton rather than conventionally-grown cotton. Lee offers a wide range of natural fiber fabrics, along with soy-based cushions, back and throw pillows made from 100 percent recycled plastic bottles, low-VOC finishes and wood frames from certified sustainable forests. And of course, no flame-retardant chemicals are used. What else can you do? One of the best ways to care for the environment is to buy furniture that will last, keeping it out of landfills. 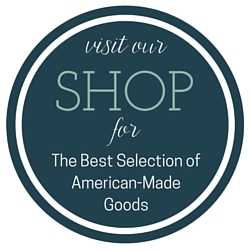 Poorly-made imported furniture is practically synonymous with “disposable.” Buying quality furniture that will last provides a benefit, not only for your bank account, but also the environment. « Types of Pillow Stuffing: Which Cushions are the Best Quality?